I just woke up early this Saturday morning, checked the forecast to make sure they were still just calling for another dusting of snow and instead, I got a big National Weather Service snowball in the face. 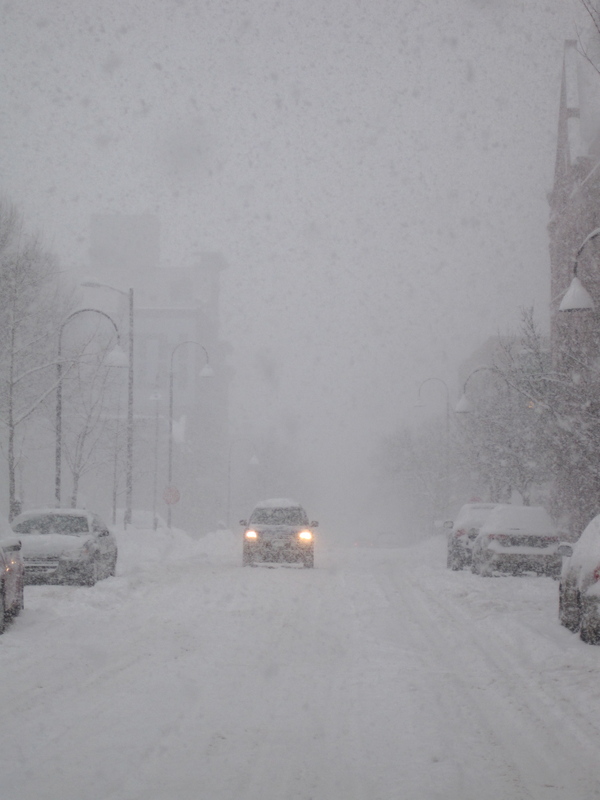 A snowy scene in Burlington, Vermont on Wednesday. Looks like we're in for a repeat tonight. Oops. Try at least four more inches tonight. Probably six, to be exact. Do I hear a ten? As it stands, I already feel like one of Gladys Knight’s Pips. You know how the Pips danced in the background, making those moves like they were shoveling? Well, baby, I sure have been shoveling after all the snow we got recently. I haven’t even quite finished cleaning up from the last storm. I should accept Gladys Knight’s suggestion and take a midnight train to Georgia. There’s less snow down there. But then, the train schedule is probably canceled due to too much snow on the tracks. It’s gotten to the point where I have to shovel the back deck so it doesn’t collapse. And if this keeps up, it’s up on the roof for me. Got snow? Yup. 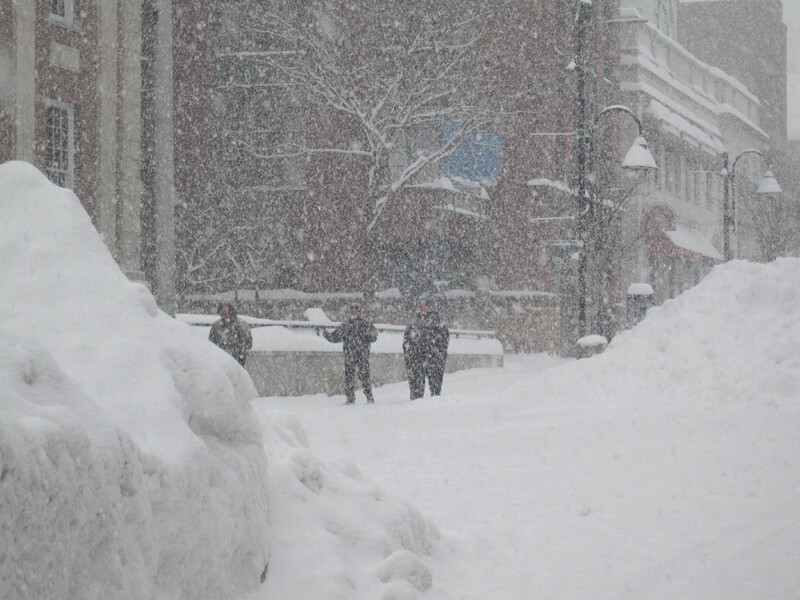 College Street in Burlington, Vermont on Wednesday. More weather like this is coming. Other parts of Vermont and New England have gotten much more snow than I have. I just did a story for the Burlington Free Press about a barn roof that collapsed in Essex, Vermont the other day. And in southern Vermont and elsewhere in New England, barns, houses, shed, warehouses and commercial buildings have been giving up the ghost under the layers of snow and turning into big piles of icy rubble. I like exciting weather, and I like to play in the snow, so on one hand this is kind of fun. On the other, it’s not. The snow is deep, the paths are narrow. You can’t just walk anywhere. It’s getting claustrophobic. At least it’s not as claustrophobic as the what the guy in Newfane, Vermont went through. He was using a snow rake to get the snow off his garage roof when it all came down on him. He was trapped and buried, except for his head and one gloved hand, until finally rescued a couple hours later. Police said the guy was in good spirits after being rescued. Well, I’d be in a good mood if I thought I was going to die a cold, lonely death in a snowbank, but somebody got me out before things became too dire. Speaking of dire, after tonight’s snowfall, they say we will get more Monday and Tuesday, and maybe Thursday. I’m not sure where I will put all that snow I might need to shovel. Maybe mail it to Costa Rica or something? This entry was posted on February 5, 2011 at 12:18 pm and is filed under Uncategorized. You can follow any responses to this entry through the RSS 2.0 feed. You can leave a response, or trackback from your own site.